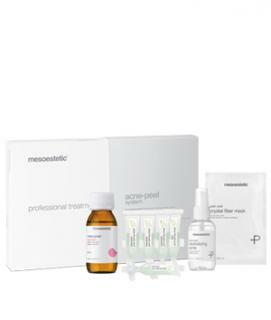 Professional method for intensive treatment of acne-prone and seborrhoeic skin. It deep cleanses the skin surface of acne impurities for optimal functioning of the pilosebaceous follicle. acne peel system offers a cross-cutting approach to address the numerous factors that trigger the disease, combining an intensive clinical treatment for professional use with a home care treatment comprising a complete range of products. Chemical exfoliant which contains a combination of azelaic acid and salicylic acid. It has antifungal, anti-comedone and pigment regulating. properties. Face mask comprising nanofiber distributed in 3D. It reduces skin surface temperature, restructure the water-lipid layer and increase skin moisturising levels. Gel that acts as a protective shield to prolong and maintain the effects of the active ingredients applied during treatment, while it soothes and tightens the pores. Solution formulated at pH 8.6 for peeling neutralization effect.